For the first time, Pediatric Clinics is devoting one issue to two clinically focused topics: Pediatric Palliative Care and Pediatric Hospital Medicine. Dr. Ottolini has organized her section to focus on a variety of issues of relevant to all pediatricians, but which pose special challenge to the Pediatric Hospitalists. As pediatric care has advanced, children who would not have survived infancy are growing into young adults with complex chronic diseases and dependence upon technology. They frequently require hospitalization to address exacerbation of underlying disease processes and procedures to improve their quality of life. The articles are devoted to patient care challenges of troubleshooting malfunctioning technology, co-managing medically complex patients pre and post-op with surgical colleagues, and the Hospitalist’s evolving role in performing procedures and sedation in this population of vulnerable patients. Also discussed rare strategies to maximize communication with parents, patients and primary care providers during hospitalization, especially for medically complex patients. Dr. Ullrich and Dr. Wolfe Pediatric have worked to bring relevant articles on palliative care to the pediatrician. While life-threatening conditions in childhood are rare, children with LTC account for a high proportion of pediatric hospital care, and about one half of such children die in the inpatient setting. The number of hospital-based pediatric palliative care programs has increased dramatically over the past decade to meet the palliative care needs of hospitalized children including symptom management, facilitation of communication, decision-making and advance care planning support, and coordination of care. 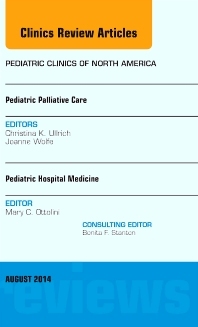 Given these considerations, it is evident that the topics of pediatric palliative care and hospital medicine are fitting counterparts for this comprehensive issue.